A good friend of ours, David A. Gell, died on March 2. We will be attending the memorial service tomorrow. David, a Canadian by birth, was organist at Trinity Episcopal Church, Santa Barbara for many years. We first met in 1997, when the Cantori Domino choir (from here in LA) was doing its first workshop with Sir David Willcocks, at the Casa de Maria in Montecito (our services were at Trinity). I was doing some of the organ playing for this and subsequent workshops, so was in contact with David. Quickly we became good personal friends as well, and he liked my playing enough to kindly invite me to perform on Trinity’s Advent organ concert series several times in subsequent years. He singlehandedly ran this series, one of the finest parts of the music scene in Santa Barbara, always followed by a festive dinner, hosted by his gracious wife Carolyn, at their home. He also had me play an evening concert on Trinity’s excellent new console just last November, for which he kindly turned pages. Little did I know that would be our final collaboration. I will remember him for his great enthusiasm and optimism for his profession, his breadth of repertoire, and sense of humor. There is a slogan: “Don’t let your music die.” David didn’t. I know the memorial service, with Emma Lou Diemer at the organ and the excellent choir of Trinity directed by Grey Brothers, will be both appropriate and memorable. Well done, David. We’ll miss you much. Ave atque vale! Some of you know by now that I’m leaving my longtime church, St. Francis Episcopal in Palos Verdes Estates, CA. I’ll be starting early next month as Minister of Music at St. Michael and All Angels Episcopal Church in Corona del Mar, which is in southern Orange County near Newport Beach and Irvine. My wife and stepdaughter tell me it’s the setting for the TV show Arrested Development! My final Sunday at St. Francis is January 5. I’ve been at this church for close to 25 years, and some of my deepest roots, musical and emotional, are there – the building with its marvelous acoustic, the people, and the South Bay area. I met my wonderful wife there, and our dear daughter, now a college freshman, wouldn’t exist if the Rector at the time, The Rev. Robert Dunn, hadn’t hired me, ‘way back in 1989! It’s been a long and basically a good run, and I’ve had many great experiences there. But now with our daughter gone we are semi-empty nesters. It seemed time for a major church move for me, this position came up, et voila! I am excited about it – I’ll be playing a fine organ in a fine acoustic, and directing potentially the best adult choir I’ve ever had, with four section leaders and the ability to hire other musicians, both vocal and instrumental, for occasional services (recently I went unannounced to a Lessons and Carols service there which was quite good). There is also a bell choir, in which a former Associate at St. Francis and a longtime friend, The Rev. Dr. Barbara Stewart, is a member. They also have a children’s choir, and a Friends of Music group with an active concert series (I’m already booked for a program with a string quartet next May!). And there’s a Corona del Mar Baroque Festival I hope to get involved in. So, I guess that’s God’s Christmas gift to me! Happy holidays to all of you! Many years ago, I took advantage of a singular opportunity to travel to Santa Barbara to reconnect with one of my heroes, Sir David Willcocks (I had accompanied for him for many years at Westminster Choir College, among other places, during the 80s, when I lived in the east), at a choral workshop put on by Cantori Domino. This led to a 15-year relationship where my dear wife and I both sang, and I occasionally played in their orchestra. Now, with the sad passing of Mary Gerlitz (see “A Fond Remembrance” below), Cantori Domino’s artistic director, Bunny Thornburgh, has asked me to be their new accompanist, and I have accepted. With enthusiasm! Though I enjoy singing very much with this group – one of the finest choirs in LA – I am very much looking forward to playing for this outstanding group of singers as well! It will be great fun as well as a privilege to accompany for this choir! Organists, Sir David Willcocks workshop, Santa Barbara CA, 1990s. 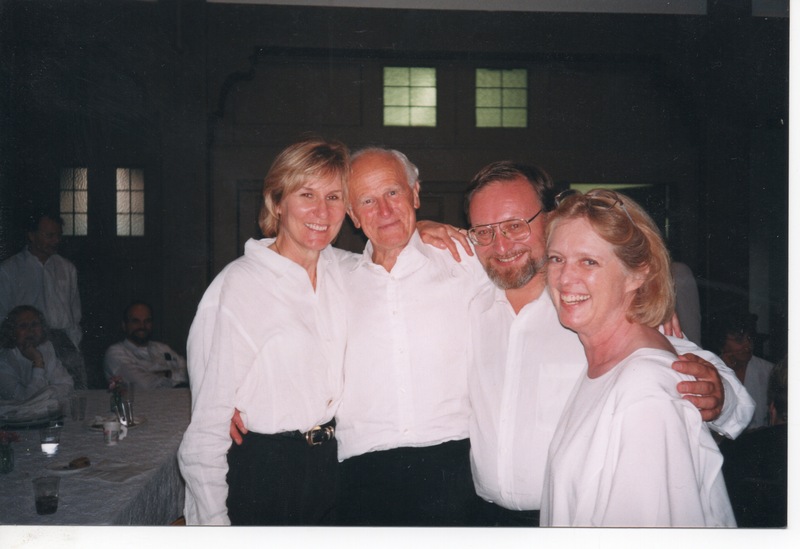 From left: Elizabeth Rembolt, Sir David Willcocks, Ray Urwin, and the late Mary Gerlitz. We’re back now. It was a glorious time in England, and I do have stories, as promised! But York will be my next post (or two). For this one I want to bid a fond farewell to a beloved person, one of Cantori’s founders. Recently it was my privilege and pleasure to serve as organist for the memorial service and celebration of the life of Mary Gerlitz, a longtime organist in the LA area, and accompanist, administrator, and General Goddess in Residence for the Cantori Domino choir. We had returned from England only a few days before. Over the previous year Mary had made the basic arrangements for the tour, and she and I were to share the accompanying duties. But shortly before we left she suddenly became very ill, and it quickly became clear that she would not be going. She died on August 1. We all knew she was very seriously ill, but it was still a huge shock. The service, held at St. Augustine by-the-Sea last Friday night (August 9th), was lovely – simple and direct, with a superb mix of music and words, and eulogies of fond and admiring content. Prelude music was Joseph Jongen’s impressionistic Petite Piece and a Bach instrumental aria. The organ loft was packed with former and current Cantori members, who sang Brahms’ Let nothing ever grieve thee so very beautifully – I could feel as well as hear the love and affection for Mary as they sang, both in the rehearsal and service. The service also included some of Bach’s best: Bist du bei mir sung by Bunny, and the Aria from the Goldberg Variations. We also sang the great hymn O God, our help in ages past. The choir (which includes some of the finest vocal musicians in LA, including several members of the Roger Wagner Chorale) had gone down into the congregation by then, and one doesn’t often hear hymn-singing like THAT! :) Thanks so much for that, Cantori – that’s one of my very favorite hymns: a perfect match, I think, between text and music, the greatest funeral/memorial hymn ever written, perhaps the greatest hymn, period. I will never forget our moving rendition of it, and don’t expect to experience hymn music-making like that this side of Heaven! I will never forget it. And several singers noticed that I had composed the previous hymn in the book! I knew Mary would also want a big piece for the closing organ voluntary, the last music of the service. Instead of selecting one of the usual suspects, I played Swiss organist Lionel Rogg’s magnificent toccata setting of the Advent chorale Wachet auf, ruft uns die Stille (I played this piece at OLA a while ago). A lovely reception followed, thanks to Betsy Wheeler Kollgaard, Susan Kasenow, my dear spouse, and many others. Last but not least, my personal thanks to Cecilia for quickly finding some last-minute music I needed online, and to The Rev. Mark Goldfarb, the Rabbi at my wonderful Temple Beth Ohr, who graciously let me have the evening off for the service. Bunny told the group several times, both in York and at the service, that I had been Mary’s choice as the sole accompanist, should she be unable to go. I felt honored and remembered this throughout the tour and the service. Mary certainly deserved no less than my best and the choir’s, and we all knew it. I still find it difficult to believe, and accept, that she has passed. But I think we gave her a good send-off, and she is pleased, wherever she now resides! Mary was one of those people who had been around “forever;” after all, she and Bunny had co-founded Cantori Domino. All of us have very fond memories of her. My personal eulogy: in the many years I knew and worked with her I don’t remember ever having heard her utter a bad word or negative comment about anyone, even when such opportunities arose – and indeed sometimes even invited such comments! Quite the accomplishment! And a great example to us..
She will be long remembered and greatly missed. Rest in peace, my colleague and friend.